Class 1A will begin district play this week. The classification includes only 31 schools, while the new format allows for 32 qualifiers into the playoff bracket. That means that everyone is already in, but the next three weeks of district play will help determine the playoff positioning. Also unique to 1A is that District 8 contains only three teams. As a result, each team in that district will have an open date in the coming weeks, and the district champion from District 7 will get a bye into the second round of the Class 1A playoffs. Pleasanton is one of the best stories in Class 1A this season. The Blu-Jays returned to 11-man football this season after reaching the 8-Man, Division II playoffs last season. That playoff experience broke an eight-year postseason drought. The Blu-Jay rolled to a 4-0 start before filling in their schedule with an 8-Man game against Osceola (Mo.) last week. Pleasanton’s air-raid offense is led by the sibling due of Kaden and Kasen McKee. Kaden is the senior quarterback, while Kasen is a junior wide receiver and his brother’s favorite target. Blake Pohlmeier, a Washburn Rural transfer, has provided another playmaker in the backfield. Pohlmeier rushed for two touchdowns and had two interceptions on defense in last week’s 38-22 win over Osceola. Coach Dustin Johnson likes to spread the field and show multiple formations. He calls senior Turner Dent, one of the top linemen he’s ever coached. On paper, Colgan looks like the prohibitive favorite in the district. The Panthers began the season with impressive wins over Columbus, Frontenac, and Baxter Springs. But Colgan has since lost two straight games to Centralia and Abilene. The Panthers have kept things on the ground where they average nearly 250 yards per game. Quarterback Cade Simmons has led the offense with 525 rushing yards and six scores, while classmates Matthew Lomshek and Kash Marietta have combined for 614 yards and six more touchdowns. The Panther defense has given up only 11 points per game. Linebacker Luke Orender has followed-up a breakout junior season by averaging nearly 9.5 tackles per game this season. Uniontown will begin district play with road games at Pleasanton and Yates Center. The Eagles’ lone win came 52-12 against winless Northeast-Arma back in Week 3. Since, Uniontown has dropped games to traditional contenders Lyndon (42-14) and Olpe (48-6). Like Uniontown, Yates Center’s only win of the season came against Northeast-Arma (42-22). The Wildcats pushed Leon-Bluestem last week before falling 30-27. Senior Thayne Smith and freshman Kendrick Jones are the Wildcats’ primary threats out of the backfield. Olpe had high expectations for the 2018 season after returning nearly all their key skill players from a team that reached the Class 2-1A semifinals a season ago. The Eagles have responded with a 5-0 start that has featured a stout defense that has given up only 32 points all season. The Olpe backfield returns all-state running back Blaine Hinrichs and Kynden Robert who is coming off of a breakout freshman season. Quarterback Colby Hoelting directs the Eagle offense and has his brother Camden Hoelting back at wide receiver. The Eagles have a solid resume through five weeks, including a 20-18 road win at No. 5 Jackson Heights, a 13-8 win over a solid Christ Prep team, and a 31-0 shutout of Burlington. Hillsboro opened some eyes by pushing 3A contender Hesston before falling 42-36. Since, the Trojans have won four consecutive games. Hillsboro is averaging 37 points per game behind a breakout season from quarterback Jorge Hanschu. Marion has struggled to a 1-4 start after reaching the second round of the Class 3A playoffs a season ago. The Warriors have lost three consecutive games in which they have given up 50, 62, and 51 points. Shaun Craft replaced longtime coach Grant Thierolf, who retired after leading the Warriors to 37 wins over the past five seasons. Leon-Bluestem is coming off of its first win of the season and Jeremiah Fiscus’ first victory as the Lions’ coach. The Lions beat Yates Center 30-27 last week. 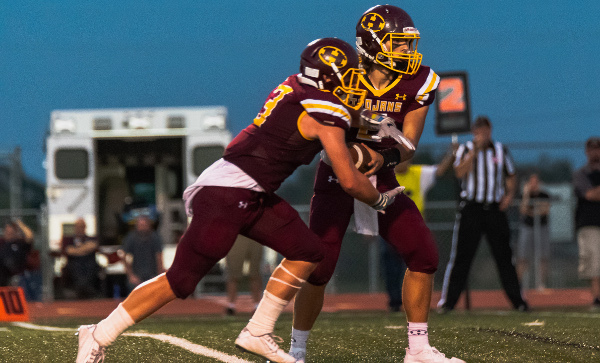 Bluestem had opened the season with three losses by 14 points or less to Tri-Valley League opponents before being blown out by Pleasanton in Week 4. Jackson Heights and Troy headline a District 3 that is comprised of traditional playoff contenders. Jackson Heights’ lone loss came 20-18 to No. 2 Olpe in Week 2. The Cobras rebounded last week as Kolby Rethman scored on fourth down from the 2-yard line with under a minute left to go to defeat Valley Heights, 22-14. The Cobras have turned to Rethman and Cooper Williams after graduating all-state running back Brady Holliday from last year’s team. Cable Wareham has stepped in a quarterback and Conlan Bruggeman has also been a reliable option out of the backfield. Jackson Heights features one of the top offensive line groups in the classification. Troy will also be a contender on the eastern side of 1A this season. The Trojans finished 4-5 a season ago after graduating several key players off of the 2016 state title team. Junior Kipp Jasper has the ability to put up big numbers from his quarterback position having thrown for 726 yards, while Reid Jasper has proven to be a reliable target with more than 350 receiving yards. The Trojans enter district play on a two-game losing streak after a one-point loss to Christ Prep and last week’s 36-22 loss at Centralia. Jefferson County North has posted blowout wins over Oskaloosa and Wabaunsee – two teams that are a combined 0-10. Outside of those, the Chargers have been competitive in losses to Pleasant Ridge, McLouth, and Christ Prep Academy. Lyndon’s Flint Hills League dominance doesn’t look like it will continue this year as the Tigers are 1-3 in league play with losses to Osage City, West Franklin, and Northern Heights. With the graduation of all-stater Dexton Swinehart, Lyndon has turned to Shawn Hinck and freshman Darian Massey as the primary offensive options. Hinck has delivered 427 yards and six scores, while Massey has passed for nearly 300 yards but been intercepted eight times. Centralia began the season as the No. 2 ranked team in Class 1A. The Panthers then opened with consecutive close losses to 3A contenders Rossville (26-14) and Riley County (26-21). Since then, Centralia has won three straight over St. Marys, St. Mary’s Colgan, and Troy. The schedule has been tough, and the offensive line has helped open holes for Isaac Gore and Kamble Haverkamp. Centralia’s home game with Valley Heights in Week 8 should decide the top two spots in this district. Valley Heights has dropped close games to Troy and Jackson Heights. Otherwise, the Mustangs have posted blowout wins over Horton, Atchison County, and Republic County. Cole Coggins has backed up his all-state sophomore season with nearly 850 rushing yards and 12 touchdowns in five games. The Mustangs have averaged 343 yards rushing per game this season. Northern Heights enters district play having won two straight games. The Wildcats won at Yates Center (40-8) two weeks ago, then beat Lyndon (21-12) last season for their first win over the Tigers since 2009. Senior Marcus Waters has been steady in passing for 492 yards and six touchdowns, while five different receivers have more than a half-dozen catches. Wabaunsee’s first season as an independent in football has resulted in a winless start through five weeks. The Chargers have averaged less than ten points per game, while giving up 37 points per game. Smith Center, the defending Class 2-1A state champions, is 16-2 since the start of the 2016 season with both losses to Phillipsburg. The Redmen own a quality 21-10 road win against Plainville. Smith Center averages 264 rushing yards a game and has allowed just 52 points. Seniors Ethan Peterson and Colby Benoit have 423 and 388 rushing yards, respectively. The duo, along with senior Hesston Maxwell (129 rushing yards), has combined for 13 rushing scores. Smith Center has just two turnovers and is plus-eight in turnover margin. Ell-Saline, led by standout quarterback Nick Davenport, has allowed just 54 points with an 8-6 loss against Hutchinson Trinity and a 27-13 road win versus Sedgwick. Both Smith Center and Ell-Saline rank in the top-five in scoring defense. Sacred Heart, with experienced senior skill players like quarterback David Anderson and wide receivers Charlie Skidmore and Trace Leners, have already matched last year’s win total from a 2-7 finish. Republic County, under new coach Faron Kraft, has lost every game by at least 30 points this season and have dropped 15 straight overall. These four teams have been a part of the same 2-1A/1A district since 2014. Plainville’s losses have come to Phillipsburg and Smith Center, the latter in a close 21-10 defeat that the Cardinals led for most of the second half. Plainville has finished as state runner-up and reached the sub-state semifinal the last two seasons. Three returning starters have all played an all-state caliber levels: quarterback Jordan Finnesy, running back Jared Casey and kicker/wide receiver Tanner Copeland. Plainville has averaged 138 passing and 129 rushing yards a contest. Finnesy has passed for 634 and rushed for 275 with nine total scores. Casey has rushed for 300 with four total touchdowns and has 141 receiving yards with seven tackles for loss, tied for the team-high. Finnesy has picked off three passes, and Casey has recovered three fumbles, both Plainville bests. Copeland is perfect on 15 extra points and has five field goals. Oakley second-year coach Jeff Hennick has led a nice turnaround after 1-8 marks the last two falls. The Plainsmen are nearly 4-1 after a last-second loss to Norton. Senior Kade Hemmert paces the offense with 545 passing yards, 117 rushing and eight scores accounted for. Senior Morgan Rains has played well with 38 tackles and a pair of fumble recoveries to lead the squad. While Plainville has had less than 20 healthy players, Ellis and La Crosse have fought significant numbers issues, too. Ellis won 44-34 at La Crosse in Week 4. All of the Leopards’ offensive yards come from non-seniors. Junior quarterback Hunter Morgan has thrown for 632 yards and rushed for 234 with 12 TDs accounted for. All but 35 of the team’s 292 tackles are by non-seniors. For Ellis, senior Cade Lewis has 411 rushing yards and all three of the team’s rushing scores and easily leads the squad with 781 all-purpose yards. Sophomore Tegan Cain has taken over under center. Ellis has not won fewer than three games in a season since 1994. Sedgwick senior quarterback Hooper Schroeder has paced one of the state’s most prolific pass offenses. Schroeder is expected to complete his career as the Cardinals’ leader in passing yards. This fall, he has thrown for 1,418 yards with a 13/2 TD/INT ratio. Four players have between 10 and 25 catches. The Cardinals lost to Ell-Saline, 27-13, in Week 4. Sedgwick has captured seven straight undefeated district titles. Sedgwick has tallied 209 points, second-most in 1A behind Elkhart’s 241. The Cardinals head west for meetings with Meade and Sublette, believed to the first times the teams have ever matched up, according to Kansas Football History. The Cardinals are 6-0 against Inman since 2008. Inman opened with a 37-36 overtime victory against Belle Plaine and have enjoyed a big turnaround after a 0-9 mark in ‘17. Inman has not posted a winning season since ‘13. Meade has not had a losing record since ’05. The Buffs have averaged 223 rushing yards a contest with only 18 passing yards a game. Senior Jarret Stapleton leads the team with 345 rushing yards and eight rushing scores. Sublette has dropped 28 straight contests. District 8 is 1A’s only three-team district as a result of there only being 31 schools in the classification. Elkhart is the significant favorite and has been in the top-five all year long. The Wildcats easily pace the classification with 241 points. Elkhart owns a quality Week 1 victory against Class 2A Cimarron, a one-loss squad. Senior quarterback Lane Whisennand is a returning all-state player with 20 of 33 passing for 424 yards with a 9/1 TD/INT ratio. He has rushed 75 times for 799 yards and 12 scores, all team-highs. Rare for a quarterback, Whisennand is the primary returner and has 1,104 all-purpose yards. Seniors Javier Gomez and Elian Prieto have 16 catches, half for scores. Junior Chace O’Hair has 45 tackles, easily the team best, and is tied for the team lead with five TFLs. Syracuse has matched last year’s win total from a 3-6 season. Senior Edgar Gonzalez has 72 carries for 373 yards with four rushing scores. Syracuse has averaged 246 rushing yards and 4.9 yards per carry with nine turnovers forced and a plus-four turnover margin. Stanton County is one off last year’s win total from a 2-7 season under alum Bret Kendrick, in his second stint as head coach. The Trojans won at Beaver (Okla.), 41-0, in Week 1, lost three straight games and defeated Sublette, 22-12, at home last week.